*Las Trampas Regional Wilderness offers 5,342 acres of wilderness and an expanded trail system that allows hikers and horseback riders to enjoy its remote and rugged areas. The park’s size and terrain allow visitors a feeling of privacy and escape from urban hustle and bustle. This challenging loop goes around Las Trampas Regional Wilderness up to the Three Peaks. Climb Ringtail Cat, Madrone and Corduroy Hills Trails up to Eagle Peak before dropping down into the canyon for the climb up to Vail Peak on the Las Trampas Ridge Trail. Continue on Las Trampas Ridge for the ascent to Las Trampas Peak at 1827 feet. Start this trail hike from Ringtail Cat Staging Area at the end of Hemme Ave in Alamo. Ringtail Cat Trail begins with a flat stretch along a seasonal creek to the South Ave junction. Go left to stay on Ringtail Cat Trail; it climbs up through the beautiful woodlands to the Madrone junction. Go straight onto Madrone Trail and head up the steep hill towards the ridge top grassland area. Enjoy the ridgeline views of Mt Diablo and the surrounding valleys! At the ridge top-turn left to stay on Madrone; the trail gently drops down into a wooded canyon before tilting back up towards the ridge. At the Corduroy Hills junction- turn right onto Corduroy Hills; it winds up towards Las Trampas Ridge with a moderate climb. Look around and take in the amazing views! At the unsigned trail split-turn right; the trail winds around the hill with wonderful views. *Las Trampas Ridge, reached via Chamise and Bollinger Creek Loop trails, is east of Bollinger Creek. The view from the ridge affords the sights of the Ygnacio, San Ramon and Amador valleys, Mt. Diablo, Carquinez Straits and other distant points of interest. When you reach the fork in the road-take the middle trail to stay on Corduroy Hills; the single track goes up and around the steep hill as it make its way into the woods. Corduroy Hills travels through the woodland before emerging out onto the grassland. The rolling terrain leads you back through the beautiful dense oak woodlands to a steep climb up the wooden steps to the trail junction at the base of Eagle Peak. *The dominant trees are coast live oak and bay laurel. Other species are buckeye, big leaf maple, canyon live oak, black oak and scrub oak. The latter, with its mistletoe, seems to prefer the ridgetop habitat at the end of Chamise Trail. Half a dozen fern species are found in the park and there are large areas of grassland. Follow the trail on your left to the summit of Eagle Peak-1720′; it leads to a bench overlooking the valleys with Mt Diablo in the backdrop. Sit for a spell and enjoy the magnificent views! Descend Eagle Peak and continue on Corduroy Hills Trail; it drops down into a wooded canyon area through dense chaparral covered slopes and rock outcroppings-watch your footing! Turn around and take in the views of the rock formations below Eagle Peak. *Two major Bay Area faults–the Las Trampas and Bollinger faults–account for the uplift and exposure of four well-defined geological formations. The Orinda formation holds remnants of ancient beach and shoreline; the El Sobrante formation consists of several fossil-bearing compressed rock layers; and the Pinole Tuff is of volcanic origin. The climb out of the canyon is steep-the wooden steps leads up to a wooden fence at Las Trampas Ridge Trail junction. Turn right onto Las Trampas Ridge Trail and continue to the unmarked path up to Vail Peak-watch your footing on the scramble to the summit. Retrace your steps back onto Las Trampas Ridge; the trail cuts in and out through the woodland with fabulous views of Rocky Ridge. At the Bollinger Creek Loop Trail junction: go straight to continue on Las Trampas Ridge Trail; it travels north along the ridgeline with open views of the surrounding valleys, peaks and Mt Diablo! Take a moment and enjoy the glorious panoramic views! Las Trampas Ridge Trail continues with a rocky climb up towards the next high point. At the Bollinger Creek Loop Trail junction: go straight to stay on Las Trampas Ridge Trail. The trail continues to climb up along the ridge with fantastic views of Las Trampas Ridge, Mt Diablo and Las Trampas Peak! Las Trampas Ridge Trail kicks up with a steep climb up to the trail junction at the cattle gate. 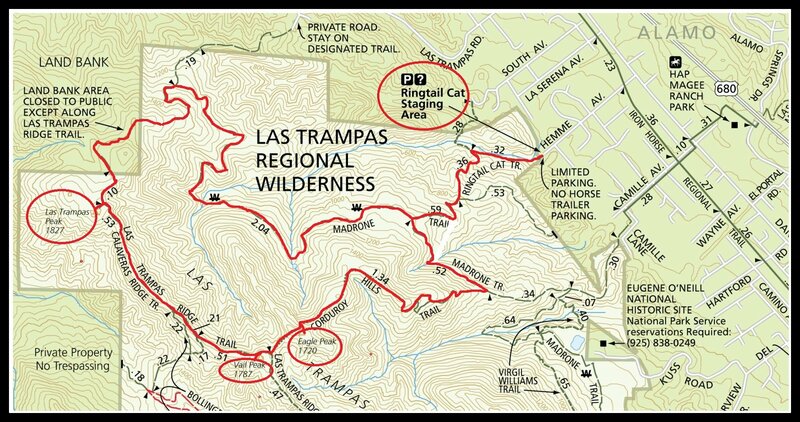 Enter through the gate and turn left for the hike up to Las Trampas Peak-1827′. Lunch stop at the summit along with another geocache find! Descend Las Trampas Peak and continue north along Las Trampas Ridge Trail. Las Trampas Ridge Trail gently winds down around from the ridge through the open grasslands to the cattle gate. Grand panoramic views all around! At the Madrone Trail junction: go straight onto Madrone. The trail continues to wind down from the grassland into the woods before emerging out to an open clearing. Madrone Trail descends into a canyon area through the gorgeous woodland. The moderate climb out of the shaded canyon continues underneath the canopy of trees with beautiful dappled sunlight and fall colors. The trail exits the woodlands out onto the grasslands to the trail split at Ringtail Cat junction. Turn left and head downhill to Ringtail Cat Trail; the trail winds around the hillside with fabulous valley views! At the Madrone Trail junction: turn left to stay on Ringtail Cat Trail; the trail descends through the scenic woods to the South Ave junction. This is a fabulous hike up Las Trampas Ridge to the Three Peaks. On a clear day, the ridge top vistas are absolutely phenomenal! Add geocaching to the hike and it makes for a fun treasure hunt too! It’s a great way to spend a day out with nature and all that it has to offer-it’s all free! Weather: Sunny and cool with partly cloudy skies. Temps ranged from the high 50’s to mid 60’s with SW winds.